CRIPSiE Vlog and dance video with front page content in ASL . 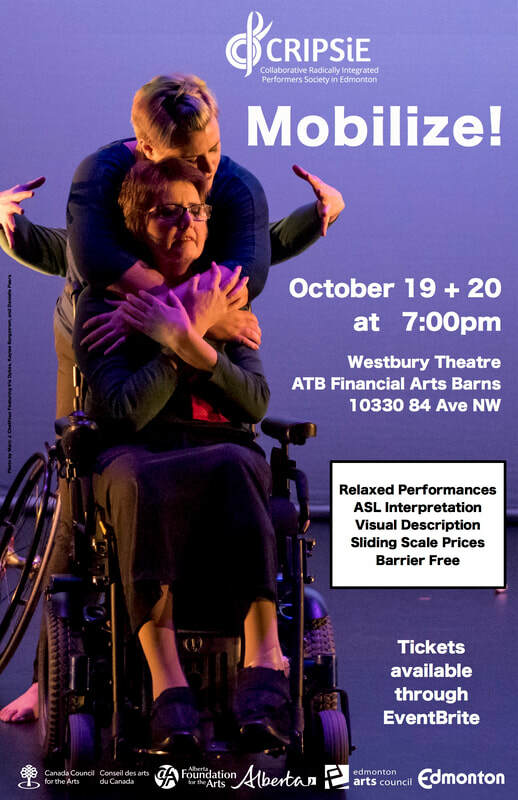 CRIPSiE (The Collaborative Radically Integrated Performers Society in Edmonton) are an Edmonton-based collective of artists that include people who experience disability and their allies. We challenge dominant stories of disability and other forms of oppression, through high-quality crip and mad performance art, video art, and public education and outreach programs. ATB Cares takes no fees, issues receipts, and will match 15% of your donation! Join us for an exciting evening of new integrated dance works by CRIPSiE artists. Featuring choreography by Kelsie Acton, Lindsay Eales, Nathan Fawaz, Alison Neuman, as well as an improvised dance collaboration with Gerry Morita and Jodie Vandekerkhove. Come train in integrated dance technique with CRIPSiE artists! Classes will be improvisation focused, drawing on the DanceAbility method of teaching accessible movement improvisation. Appropriate for everyone. Please come dressed to move and minimize the use of scents if possible. The Arts Barns are physically accessible with a gender neutral washroom. They are located two blocks from bus stops on Whyte Avenue.